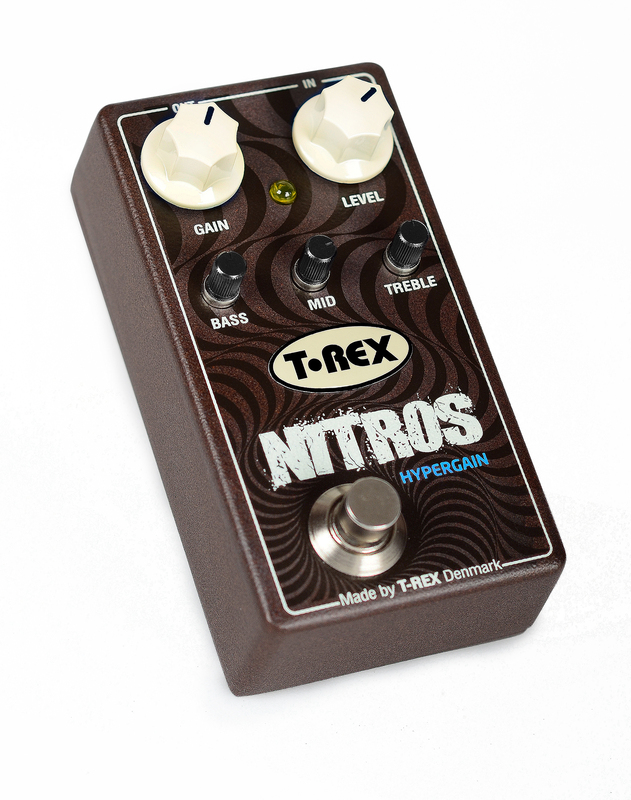 The T-Rex Nitros certainly does capture a very punchy and scooped high gain distortion, but being the most tweakable dirt pedal we make, it will also do the "80´s hair rock" sound to a T. And that´s with the gain knob set high...lower settings are great if you are looking for texas boogie-rock. By incorporating an active 3-band EQ, the "color" of the distortion is highly adjustable, and the range of the EQ knobs is extremely broad. At moderate cutting/boosting, the Nitros lives in guitar hero land but start turning the knobs to the extremes and all kinds of cool tones will emerge. Anything from "Oops, I forgot to turn off my wah" to "Dude, your amp is facing the wall!!!!" is obtainable -- the tones you can get are quite diverse if you really go for it! For over-the-top scooped metal, classic rockor even alternative styles, the Nitros Hypergain will deliver the goods in spades, but its strength lies in how the basic voicing can be altered to taste -- and beyond!